We’re proud to announce we’ll be taking part in this years return of the famous Westcountry Hot Air Balloon Fiesta held on the first weekend of September. 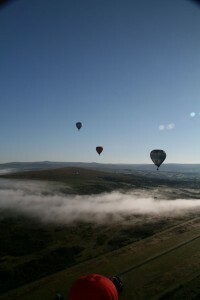 The event is in a new location just by the main college of Tavistock and, to date, has over 30 confirmed balloonists attending with their individual balloons. As the only commercial balloon rides business at the event we’ll both be selling balloon rides at the festival as well as conducting two flights during every flyable slot. The Westcountry Balloon Fiesta is a great day out for families with mass ascents every morning and evening. With balloon related activities happening during the day. As a event it’s organised by the Tavistock Lions Club and the Round Table with all money raised going to both local and regional charities. This year also sees’ a return of Aerosaurus Balloons working in conjunction with the clubs to help sort out the administration and ballooning side of the event. Providing a weather service and a strict monitoring of all balloons to make sure that it remains a safe, well run, hot air balloon festival. For more information on the event, please visit the official Westcountry Balloon Fiesta website.